Beyond Fest Announces Full 2016 Slate - Guests include Paul Schrader, Kurt Russell, James Gunn, Ti West, RZA, and more! Los Angeles, CA - Thursday, September 8, 2016 - Beyond Fest, the highest attended genre film festival in the US, is excited to announce its full slate of 2016 programming featuring 27 events and 23 West Coast premieres of mind-bending movie madness. 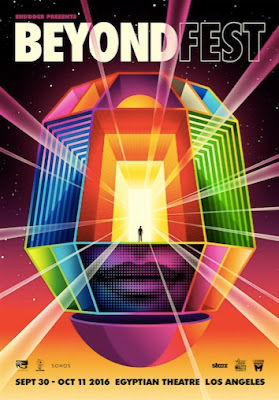 Presented by Shudder, Beyond Fest returns to Hollywood’s famed Egyptian Theatre for 12 days of movies, music and mayhem spanning Friday, September 30th - Tuesday, October 11th to generate funds for co-presenter, the nonprofit American Cinematheque. With a diverse slate that includes films from all corners of the globe Beyond Fest is proud to open with movie icon Paul Schrader presenting his new feature DOG EAT DOG and a special 40th anniversary screening of TAXI DRIVER. Other hotly-anticipated titles making their West Coast bows include the hyper-explosive coming-of-age cannibal drama RAW, Ana Lily Amipour’s much-anticipated follow up to her alt-cult debut, A GIRL WALKS HOME ALONE, the stunning, sonic desert trip THE BAD BATCH, the terrifying adaptation of M.R Carey’s post-apocalyptic horror THE GIRL WITH ALL THE GIFTS, and the Mo Brothers’ outrageously hyper-violent action epic, HEADSHOT. The most beloved genre films are highlighted with four event screenings over the course of this year’s festival. 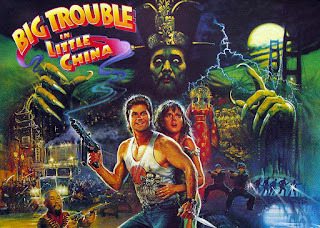 The legend himself Kurt Russell takes center stage with James Gunn moderating for a very special 30th anniversary screening of BIG TROUBLE IN LITTLE CHINA projected on glorious 35mm. The “ultimate trip” receives the ultimate treatment as Stanley Kubrick’s existential epic 2001: A SPACE ODYSSEY screens in 70mm with a 2001-scored Laserium cosmic laser concert and Q&A featuring the film’s two astronaut leads, Keir Dullea and Gary Lockwood. The Tall Man returns with J.J. Abrams’ Bad Robot meticulous restoration of Don Coscarelli’s cult classic PHANTASM: REMASTERED. Coscarelli will be joined with members of the original cast before the West Coast premiere of the series’ final entry PHANTASM RAVAGER. In keeping with the restoration theme, producer Richard P. Rubenstein will be on hand to present the U.S. Premiere of DAWN OF THE DEAD 3-D. Romero’s cult nightmare has never looked better and will be the first laser 3-D feature projected at the famed Egyptian Theatre. Returning to Los Angeles is legendary composer Fabio Frizzi and his seven-piece orchestra to perform THE BEYOND: COMPOSER’S CUT. This bold, new take on Lucio Fulci’s gothic masterpiece features a live re score featuring a completely new composition and will play with all original dialog intact. THE BEYOND: COMPOSER’S CUT will be accompanied by an uncut 35mm screening of GATES OF HELL and a very special secret screening with surprise guests. Celebrating LA filmmaking remains a priority for Beyond Fest with Ti West receiving this year’s ‘LA Spotlight’ for his transformative western, IN A VALLEY OF VIOLENCE. Beyond Fest alumni West will be joined by cast members Karen Gillan, Taissa Farmiga, Toby Huss, James Ransone, and the film’s four-legged star, Jumpy. LA also represents en masse with a midnight blast of animated anarchy as Chris Prynoski’s NERDLAND also gets its LA premiere. The first feature from Prynoski’s Titmouse Animation Studios is a wild descent into LA’s soul-destroying entertainment industry and will feature director Prynoski, writer Andrew Kevin Walker, actor Patton Oswalt, plus others in attendance. Emile Hirsch’s super creepy THE AUTOPSY OF JANE DOE, Japanese scare-fest SADAKO VS KAYAKO, Morgan Spurlock’s stomach-churning doc RATS, the revelatory Kubrick doc S IS FOR STANLEY, the hands down craziest film of the year THE DWARVES MUST BE CRAZY, and two Cinematic Void double bills featuring a premiere screening of Arrow’s 4K restoration of Romero’s THE CRAZIES paired with MARTIN on 16mm and an American Genre Film Archive fundraiser featuring a 35mm monster mash up of NEON MANIACS and STREET TRASH.